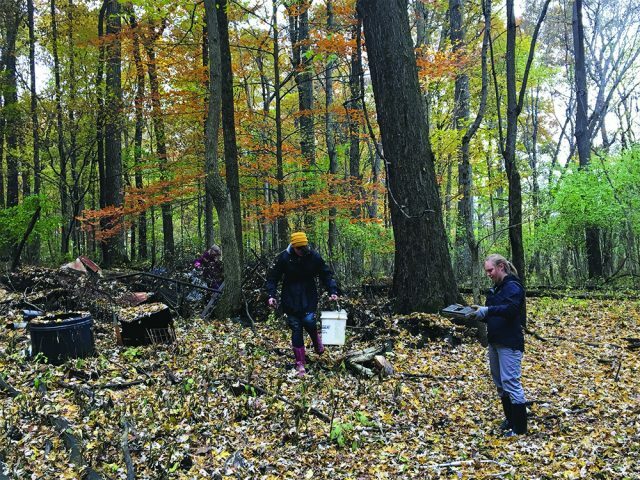 This Saturday, Dec. 1, Sustainability Leadership Semester (SLS) students Lydia Dyck and Rheannon Starr, both juniors, will be leading a trash cleanup of an old farm dump in the woods on Merry Lea property. Students will have an opportunity to clean up the local environment; the discarded objects will then be used by Goshen College’s sculpture class. Dyck and Starr have been working on finding a creative way to deal with the discarded glass, metal and garbage in the Elkhart watershed as part of SLS at Merry Lea. The dump site is located directly above High Lake and all water in the local landscape flows down from this point. Any pollution at the dump site seeps into High Lake and goes through Goshen and out to Lake Michigan. The idea of combining this cleanup initiative with art was proposed by Sarah Gothe, a Goshen College graduate student. This spring semester, art students can help weld, screw and glue the materials collected this weekend into a new sculpture to be displayed on campus. The display location has not yet been decided, but it will possibly find a home by the visual arts building or the sculpture lab north of the physical plant. It will be a visual representation of the transformative nature of sustainability. “One thing we talk about a lot in sculpture is taking material that has been discarded by society and industry, and by making it into a sculpture giving it purpose and a second life,” said John Mishler, professor of art and instructor for the sculpture class. Volunteers on Saturday will go into the woods and sort through the materials left behind at the dump site, separating out glass, metal and trash. Art students will collect the materials they want to use, and the rest will be properly disposed of. The Merry Lea students are asking for more volunteers to help clean up the dump site on Dec. 1. Interested volunteers should meet at the physical plant parking lot at noon this Saturday. Bring warm clothes, waterproof footwear and a water bottle. Snacks will be provided throughout the afternoon and the day will wrap up with a hot supper. Contact either Lydia Dyck, lydiad@goshen.edu, or Rheannon Starr, rstarr@goshen.edu, to sign up or get more information.